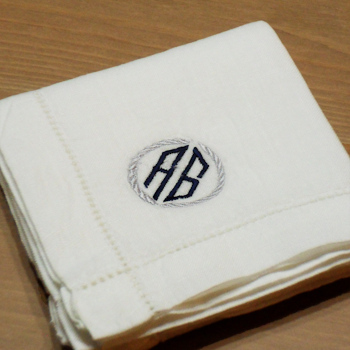 Mens Punch Hem Pure Linen handkerchief approx. 42cm. Mens Punch Hem Pure Linen handkerchief approx. 42cm. Personalised with monogrammed initials in the diamond block font set inside a silver laurel wreath border.